Below is an extract from ASPI’s publication released today, Strike from the air: the first 100 days of the campaign against ISIL . It’s apparent that the campaign to degrade and ultimately destroy ISIL is going to last for years. Apart from a steady squeezing of ISIL, which has slowed its advance and destroyed quantities of American military equipment, the coalition’s strategy has achieved little. ISIL’s position at the end of 2014 remains strong. Among its strengths is its continuing capacity to develop effective propaganda that helps to recruit foreign fighters. ISIL continues to have a substantial funding base and is well armed. 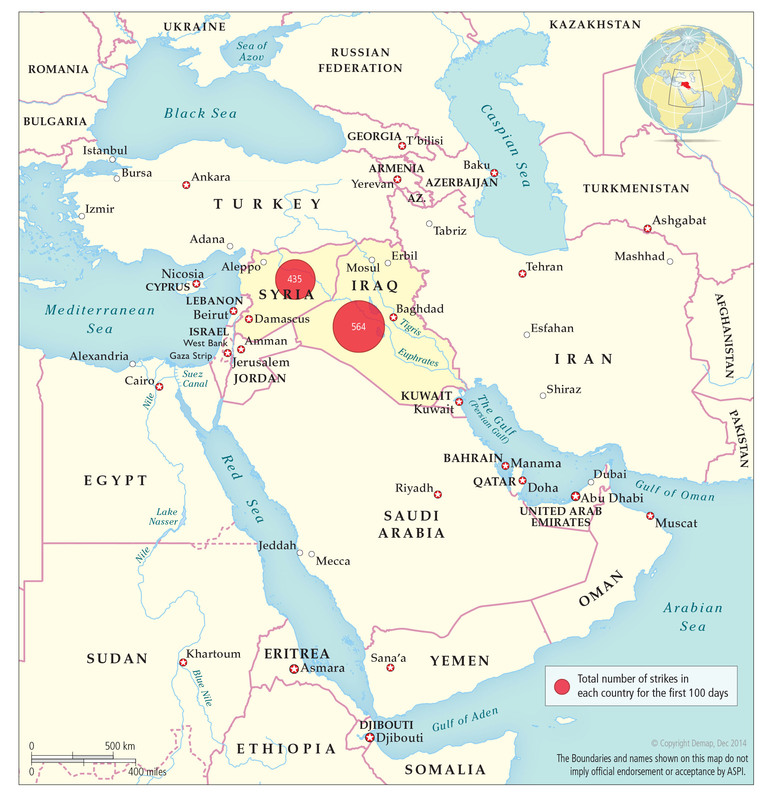 Core areas of territory remain solidly under its control in Syria and Iraq. ISIL’s broader weaknesses include the unattractiveness of its ideology to any but a small minority of potential recruits. The organisation’s shift to more conventional military capability has overextended it and caused it to suffer significant casualties, which mightn’t be sustainable for long. The US’s position is strengthened by its unparalleled capacity to use air power, which will degrade ISIL over time and prevent it from making easy gains of territory. However, that strength has to be offset against a set of broader problems and challenges for the US. First, it’s clear that President Obama will keep the US military role limited. Washington won’t deploy large-scale ground forces. Second, there’s no credible longer-term strategy to address the Syrian crisis. In effect, Obama has created a holding strategy that contains ISIL in Iraq and hits obvious targets in Syria, and is waiting for a new US President in 2016 to develop a more definitive strategy. In Iraq, some early signs in October and November suggest that some units in the Iraqi military are regaining confidence and the capacity to take the fight to ISIL. On paper, the Iraqi military is large enough to make short work of ISIL, but that ‘strength’ must be offset by the reality that ISIL remains firmly in control of much of the Sunni areas in Iraq. There’s yet to be a turning point in the campaign. Baghdad remains under regular terrorist attack and vulnerable to the same psychological pressure that caused much of the Iraqi military to throw down its weapons in mid-2014. It’s not yet clear that the Iraqi Government has turned a corner in maintaining a firm grip on power or in persuading Sunnis that their interests are fundamentally helped by Iraqi unity. Syria is a humanitarian disaster, in the midst of which ISIL remains the most effective anti-Assad force (with Jabhat al-Nusra and its Islamic Alliance a close second). The US strategy  for ‘expanding ongoing assistance to the moderate Syrian opposition to develop their capacity to provide local security for communities’ is the least developed and least credible part of the anti-ISIL campaign. In the absence of a more thorough-going and credible international response to the Syrian disaster, there’s no supportable case that victory against ISIL is assured. The international coalition against ISIL is holding together in the sense that a number of countries are prepared, at least for now, to support a constrained campaign of airstrikes in Syria and Iraq. Support for training the Iraqi military is much more limited, and so far the plan to train a Syrian ‘moderate’ force could best be described as an idea looking for friends. There’s no obvious international mechanism allowing the coalition to plan a longer-term strategy to counter ISIL. The coalition was flung together in great haste in September, and the challenge will be for it to survive into 2015. Australia’s role in the international coalition is limited to airstrikes on targets in Iraq and an evolving commitment to training elements of the Iraqi Army. On 25 November, the ADF Chief of Joint Operations, Vice Admiral David Johnston, briefed the media about a series of RAAF strikes  against ‘a large, well-established and hidden network of caves and bunkers that were concealed in a hill side’ near Kirkuk. Around a hundred ISIL militants were reportedly killed in that operation, which involved a ground attack by Kurdish fighters. Admiral Johnston said that Defence was ‘scoping options’ to increase ADF training numbers, should the government want to make a further commitment to the operation. Overall, his realistic assessment was that progress against ISIL had been ‘modest’ and that the situation in Baghdad was ‘fairly fragile’. Both Australian roles—airstrikes and training—are indefinitely sustainable, given the ADF’s capacity to rotate forces. The broader challenge for Canberra will be to explain how this fits into a credible international strategy with a realisable political objective. Peter Jennings is executive director of ASPI and a co-author of Strike from the air: the first 100 days of the campaign against ISIL. Image (c) Demap. Used with permission.